6 Exercises for Building Your Lower Abs – Six Pack Abs Guide! For many people, the lower abs are some of the toughest muscles to exercise. It’s not uncommon to find that your upper abs are becoming more and more visible, but the lower abs are still hidden, either because they are covered behind a small layer of fat or because their exercises aren’t giving them the lower ab results they were hoping for. Your lower “2-pack” are harder muscles to hit with standard crunches and sit ups. That is because crunches keep your lower body on the ground and put the greatest resistance on your upper abs. When you find yourself struggling to build your lower abs, you may need to change your abs building exercises. Try any of these six exercises to improve your ability to get more defined lower abs. 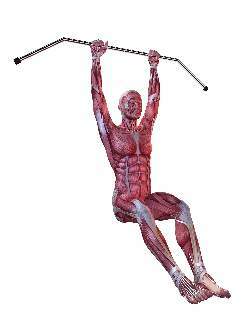 For the hanging leg lift, you will need to find a sturdy bar that you can hang from. Pull up bars work well. 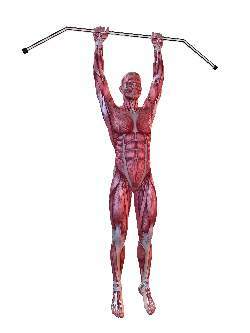 Grab the bar with both hands and let your body hang. Your legs should be slightly bent. Use your lower abdominals to left your legs up off the ground and get them as high as you can. Then slowly bring your legs down. Do not simply let your legs fall – make sure you are controlling your movements. Standard crunches involve keeping your feet on the ground and lifting your body with your abs towards your knees. Reverse crunches switch those movements. Keep your back against the ground with your arms flat on your sides. Cross your feet, keep your knees bent, and use your lower abdominals to lift your legs up into the air until you’ve created a 90 degree angle with your legs and your upper body. Make sure you are using your abs to left your legs, rather than swinging your legs and hips upwards. 4 Time Abs is another great exercise for working your lower abs. The key here is slow, deliberate movements. Start with your entire body flat against the ground and your arms behind your head. Then slowly lift your right leg in the air towards the ceiling. As soon as you’ve gotten your right leg as high as possible, follow that up with your left leg. Once both legs are in the air, bring your right leg back down, and once it’s down follow that up with your left leg. Bicycle crunches are one of the most effective abs building workouts available. Lie on the ground with your back against the floor and your arms behind your head with your elbows out. Lift one leg in the air with your knee bent towards you, and let the other leg hang a few inches off the ground. Then switch positions with your leg as though you’re pedaling a bike. As you pedal, lift your upper body off the ground and try to touch your knee with the opposite elbow. Double crunches combined the value of reverse crunches with that of a standard crunch. You start on your back with your hands behind your head and your elbows out. Your legs should be stretched out slightly above the ground (if you held it there you should feel it in your lower abs). Lift your knees slowly towards you in deliberate movements. As you lift your knees, perform a standard crunch and try to meet your knees in the middle. Then return to your starting point. Try to keep your legs hovered above the ground. Head to toe crunches are very similar to double crunches. Start with your back against the mat and your arms in the air, pointing to the sky. Lift your legs so that they are also pointing towards the sky. Try to keep your legs as straight as possible throughout the exercise. Then try to touch your toes with your hands in controlled movements. Bring your body back down slowly and repeat. It can be tough to target your lower abs. Standard crunches have a tendency to focus too heavily on the upper part of your abs, and you’ll need to build your lower abs if you want to achieve a six pack. Utilizing the above exercises can help you target your lower abs so that you can get the six pack you’ve always wanted. If you have any lower back issues, do not perform exercises where you lift both your legs up and down together. This may put unnecessary weight on your lower back. Try to only perform exercises that use one leg at a time in a controlled motion. Spend some time strengthening your lower back. When the muscles on your back are weak they may not be able to handle the pressure of your abs workout. Strengthening your lower back is a good way to ensure they are able to handle the stress of rigorous abs exercises. Always remember to stop if you are experiencing any pain in your lower back. Often that pain is a sign you may be overworking yourself. Rest until the discomfort goes away, and don’t take any unnecessary risks with the health of your lower back. The exercises that are known to build your abs often use other muscles in your body. Make sure you take the necessary precautions against injuring your lower back so that you can continue your ab workouts safely throughout your six pack ab routine. Atanu, definitely check with your doctor and I recommend staying away from ab exercises where both legs are off the ground- I’m NOT a doctor, though. The 4 Time Abs exercise may be better for you since only one leg is off the ground at a time. really great tips, thankyou, it has helped me a lot to remove lot of fats surrounding the ab muscles, travis please do a one more favour, please let me know if any low back muscle strenthening exercise. Great Info. Thanks. Now, nothing to it but to do it. Thanks again Travis. You’re welcome, Raul…Thanks for the comment! while doing crunches i fell pain on right side of my stomach .what should i do? my waist is 36 inches. if i do these exercises regularly will it help me to reduce my waist ???? and for how much time i if have to do it daily ?????? ya sure but for how much time i have to do these each exercises ??? Length of time depends on many factors: your current bf%, your genetics, your current diet & exercise habits.